Song Blend® Nyjer® Seeds are not your ordinary seeds. Nyjer® is clean, weed-free, garden-safe, and the most desired seed of finches and small birds. Nyjer® is also rich in the nutrients wild birds require, producing over 35% fat and 20% protein. Song Blend® Nyjer® Seeds are not your ordinary seeds. Nyjer® is clean, weed-free, garden-safe, and the most desired seed of finches and small birds. Nyjer® is also rich in the nutrients wild birds require, producing over 35% fats and 20% proteins. Sized-Right Foods! Finches and other small birds have tiny beaks. Nyjer® is just the right size for them to consume. Weed-Free & Garden-Safe! Nyjer® is great for gardens, since there are no unwanted weed seeds to germinate. Nyjer® is Filler-Free Too! Nyje®r is an economical seed choice; with absolutely no fillers, there’s less outdoor cleanup and more edible food per pound. 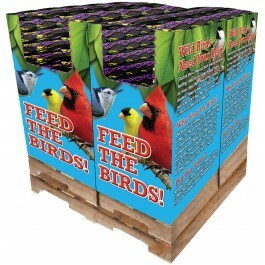 Provide Song Blend® premium wild bird products and hear your backyard wild birds sing a happy tune! That’s because “Brown’s® is Better!” After carefully choosing only the best ingredients, our unique “Five-Stage Cleaning Process” removes unwanted foreign matter to provide the cleanest, most nutritionally healthy product available. Our “Packed-Fresh” packaging process and “Barrier Bags” protect the long-term freshness and quality of our product. Whether you’re a novice or hobbyist, you’re sure to find that Song Blend® products will make your wild bird feeding experience rewarding and fun! • The Weed-Free Thistle Seed Even the Most Finicky Finches Love! Nyjer® (Thistle) Seed (Bot. Guizotia abyssiniza).